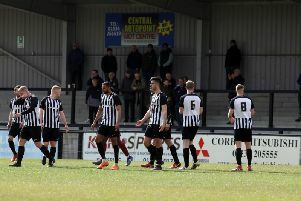 Tommy Wright has confirmed plans are in place for the Corby Town first-team to train full-time in line with the club’s academy next season. The Steelmen boss is already a full-time employee of the club as he heads up the academy while also taking charge of the first-team. And, although Corby have been all-but relegated after just one season back in the Vanarama National League North following Wednesday’s 1-0 defeat at Bradford Park Avenue, there are ambitious plans in place for the near future at Steel Park. A new pitch next to the stadium has already been fenced off and that will be used by the academy and first team for training next season. And while Wright confirmed the schedule won’t see first-team players coming in every day of the week, an increased workload is looking on the cards. “I think it is something that the club will let me do,” Wright said. “From the conversations I have had with my current players who are likely to stay, they seem well up for the idea. “It won’t be a case of having them in all day, Monday to Friday. “It will most likely be all day on Tuesdays and Thursdays in line with the academy and incorporating the first team into that. “The chairman (Stevie Noble), Paul Glass and the other board members have said themselves that we maybe came up a year too early. “But we have to re-focus and there are plans in place for the club’s future. “The pitch next to Steel Park has been fenced off and will be re-laid and levelled off during the summer and there are also plans for the dressing-rooms at the bottom end of the stadium. Wright insists he will build a team with the aim of bouncing straight back next season. The Steelmen head to Stockport County for their penultimate away match of the season tomorrow (Saturday) but Wright’s attention is already beginning to turn to a promotion push from August. “Bouncing back at the first attempt can be done,” he added. “I know what needs to be done and I would like to think that even by the middle of May, the squad for next season will already be in place.